Among some stock market professionals, W.D. Gann has a reputation for being one of the top traders and market forecasters of all time. 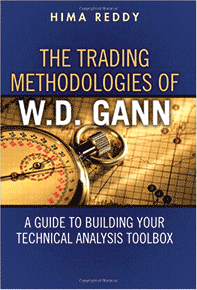 Numerous traders and technicians have adapted Gann’s methodology. He certainly was a prolific analyst, chartist and writer (10 books and courses). Whether he was as skillful and talented as his followers believe still is to be determined. Hima Reddy, CMT, an independent trader, became familiar with the subject of technical analysis and Gann’s work while still in high school, because of her father’s introduction of the subject matter. After receiving her bachelor’s degree in finance, she immersed herself in the markets and Gann’s work and became self-taught. She primarily studied Gann’s book titled How to Make Profits Trading in Commodities in learning his approach and expounding upon it in this book. Reddy’s stated goal is to enable the reader to become a better trader “… and not to make you Gann expert through this book alone.” This book is a valuable resource in light of the massive amount of material produced by Gann. The author focuses on his trading rules, principles and methods covering them with charting examples and explanations. She begins by reviewing a number of Gann’s forecasting/trading successes, but neglects to include any failures. Then using Gann’s trading methodology, Reddy delves into pattern recognition and time duration relationships, momentum analysis using the Relative Strength Index, Fibonacci numbers, moving averages and channel analysis. She found that the interpretation of certain charting tools such as trend lines and oscillators (RSI and Williams %R) are improved by applying Gann’s principles. Although Reddy mentions that she uses Gann’s trading approach and rules, she provided neither performance data nor backtested results. Therefore, readers must decide for themselves the value of Gann’s methodology by either paper trading, backtesting or trading real-time. According to Gann there are three components of a trade: Entry price, price objective and stop price. They all must be precisely determined before the trade is put on. He had specific rules for protecting profits using stop orders, as well as indicators to use to determine when to go long and short, and how to sell and go short. Gann believed that the 50% retracement was the most important retracement level. Moreover, he used a combination of price, patterns and time in his trading, as well as using simple OHLC charts to identify patterns more easily. As a guide to Gann’s works, the last chapter provides practical information on his writing style, references and mathematics. Moreover, useful tips on charting, software and indicators are included to guide the reader who plans to study Gann’s works in more depth. Reddy recommends reading Gann’s books in the order they were published and provides a source for them. This book is an excellent primer on Gann’s basic trading rules. Written in a clear and concise style with many charting examples, the author provides an easy-to-understand introduction to a well-known, rules-based trader. For those readers interested in learning about Gann’s trading approach this book a worthwhile first step. Leslie N. Masonson is the author of Buy DON’T Hold and All About Market Timing, (Second Edition). Reach him at lesmasonson@yahoo.com.